I have loved and I have been loved. I know love. There is no greater feeling. There are all kinds of love and I can’t live without any of them. I need the way my mother loves me or my brother, my sisters, nieces, nephews, my friends, and of course, a partner. But what about the love of a dog? A little over three years ago I decided I needed a pet, a dog. While growing up my family always had a dog and it was time for another one. I didn’t know what kind I wanted. All I knew was it had to be a shelter dog. So I took to the Internet and scrolled through page after page of dozens of dogs – too many dogs – who needed homes. One by one, I browsed every page, every face, and then I saw him. 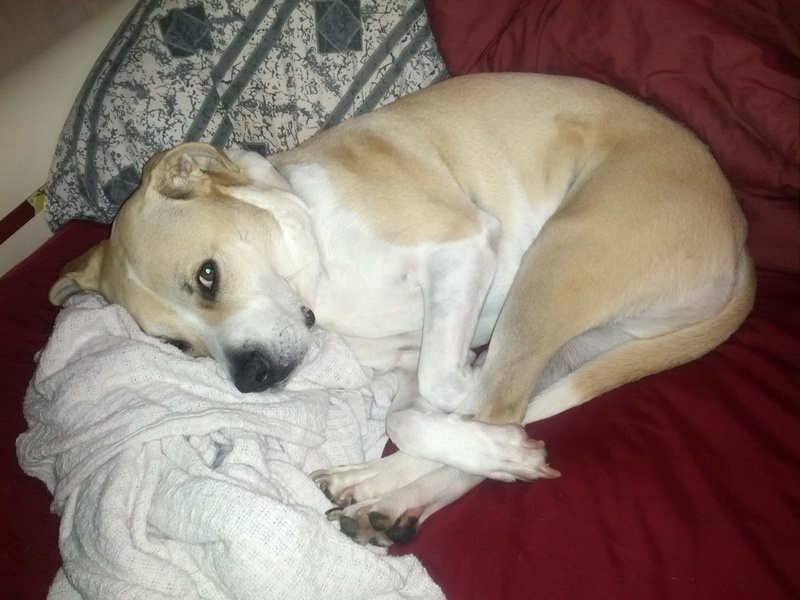 A tan and white Pit bull mix. His name was Phil and he stopped me. I had to meet him. He was in a shelter in the city. I live in the suburbs. Surely, there were shelters closer to me. Yes, there were, but Phil wasn’t in any of those and there was something about him. So I grabbed my shoes, my wallet, and my best buddy and off to the city we went. My friend and I walked into the shelter and instantly were greeted with loud barking from the many nervous and anxious dogs crammed into rows upon rows of kennels lined up in the room – a doggie prison for sure. I rushed inside and hurried down the aisles, peering into each cage, looking for the dog from the Internet who had captured my heart. The rest can play out like the greatest love story of all. I was walking so fast I almost passed up a cage where all I could see was the back of a dog and then he turned his head sideways. I stood still and for a few seconds we just looked into each other’s eyes. I smiled. I had fallen in love and from that moment on he was mine. He was quiet and calm, unlike the other dogs, and I still ask him if he knew his momma was coming for him that day. “Well, you have to meet him first to know if you get along,” she stated, with an obvious tone, but the joke was on her because I didn’t need to meet him cause I just knew. But not wanting to argue, I waited for them to set us up in a room. He came to me as if he knew me. I felt it, too. Even the volunteer commented that he’d never seen Phil take to anyone like that before. I’m aware that could have been a sales pitch because there were a lot of dogs there who needed homes, but maybe I’m a sucker because I believed him. Yes, I thought to myself, it’s as if we are truly meant to be. And three years later our love is still going strong. A dog’s love is irreplaceable. He is always happy to see you. Whether you left the house for a quick spray tan or a three day road trip, he will wag his tail while greeting you at the door, knocking down anything that gets in his way. He’ll let you take funny pictures of him at all times of the night and never complain when you post them on Facebook or Twitter (even if you didn’t get his “good side”). He will always be up for a ride in the car or a walk in the park, but is also just as willing to be a couch potato with you, never leaving you to feel like a lazy bum by yourself – a true team player. He will wait patiently on the other side of the door when you accidentally shut him out. He will let you drench him with your tears when you need a good cry without ever leaving your side. He will rush to get between you and anyone, or thing, he perceives as a threat, with complete disregard for his own safety. Best of all, he will love you unconditionally and lick your face when you need it the most because dogs know; they always know. I was 35 years old the first time I experienced “love at first sight” and it was with a dog. Sad? Probably, but it turned out great. Since then, only one other person has ever stopped me in my tracks, with just one picture, the way Phil did. I looked at this woman and just knew, the way I knew with Phil. It was in her eyes. In her smile. And I wonder if someday we will look each other in the eyes, smile, and just “know.” And maybe, I’d have to call a friend over to “stand guard” so nobody else takes her. More than ever before, I want to love someone like a dog. I don’t want to be a dog, I only want to love you like one.